NACOGDOCHES, Texas - The Friends of Music Concert Series at Stephen F. Austin State University will present Duo Karudan in a faculty-guest recital at 2:30 p.m. Sunday, Jan. 27, in Cole Concert Hall on the SFA campus. 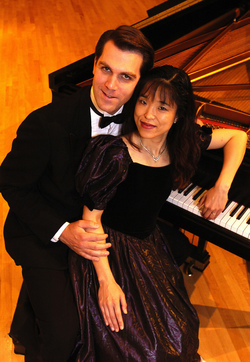 Duo Karudan includes Christopher Ayer, professor of clarinet in the SFA School of Music, and his wife, Kae Hosoda-Ayer, who is associate professor of piano at Baylor University. Ayer describes the recital as special because the program includes five pieces for clarinet and piano, all written by Canadian composers. Ayer grew up in Fredericton, New Brunswick, and attended Acadia University in Nova Scotia. "I've always wanted to compile some pieces into a Canadian program to perform," he said. "What makes this more exciting is that the recital is part of our preparation to record these works, which we will do next summer." Program works include Sonata by Leslie Mann; "Approaching the Spring Place" by Michael Miller; Sonata by Oscar Morawetz; "Passages" by Sid Robinovitch; and "Propulsions" by William Wallace. Wallace, Robinovitch and Miller are all still living, and Miller, in fact, currently resides in Ayer's hometown of Fredericton and has been active recently composing and performing. "Obviously, very few people will be familiar with this music, so it's a great chance to come out and hear some new things," Ayer said. "I chose these works because I believe they are all accessible to musicians and non-musicians alike." "Approaching the Spring Place" will remind some listeners of the 20th century British traditions of composition in the vein of Gerald Finzi, Arthur Bliss and John Ireland, Ayer said. He described "Propulsions" as "a real barn-burner," and the Morawetz and Mann Sonatas, while perhaps slightly more esoteric in nature, as "immediately arresting and interesting to listen to," he said. "I have a personal connection with the Mann Sonata as I performed it at my first appearance at the Canadian National Music Festival, an annual national music competition, representing the province of New Brunswick," he said. "Leslie Mann was a clarinetist in the Winnipeg Symphony Orchestra for many years, and he was the teacher of my first clarinet teacher, Jane Bowden. So, it's very special for me to perform it and record it." The concert is a presentation of the College of Fine Arts and School of Music. Tickets are $8 for adults, $6 for seniors and $3 for students and youth. For tickets or more information, call the SFA Fine Arts Box Office at (936) 468-6407 or visit www.finearts.sfasu.edu.